Frank Lampard is hoping for a happy Christmas at Pride Park. 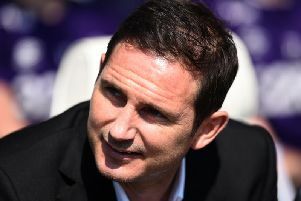 Frank Lampard believes Christmas cheer will be vital if Derby County are to maintain their promotion push. The Rams host Bristol City on Saturday before games with three of the top sides in the division, Sheffield United (Boxing Day) and Norwich (29th) away and a home game with Middlesbrough on New Year's Day. And Lampard wants wins on the board to begin 2019 on a high note. He told RamsTV: "We have to see it as a challenge and an opportunity. There will be tough games, without a doubt, and once we are past Bristol City, we will have played everyone already and we know the challenges of Sheffield United and Norwich so we have to step up. “To be successful, you have to step up in these games and we have got a bunch of them so we need to be on it. The first half of the season has gone quickly but a lot has happened too. It’s a nice halfway mark to gauge where we are at. “We are in a decent position in the table and hopefully we’ve made some progress but there is still loads more work to do. The business really does start here and now, over a busy Christmas period, I think we will be defined by the next month of football because there are so many important games. Bristol City arrive on Saturday on the back of a four game unbeaten run, currently sitting in 14th spot. Lampard added: "It will be a tough game. I watched them against Norwich at the weekend and they held their own. They drew 2-2 with the league leaders and they are a good team.